Well, not a god exactly. What Colonel Guile (Jean-Claude Van Damme) does find is one of the most blindingly and hilariously awful feature films of living memory. 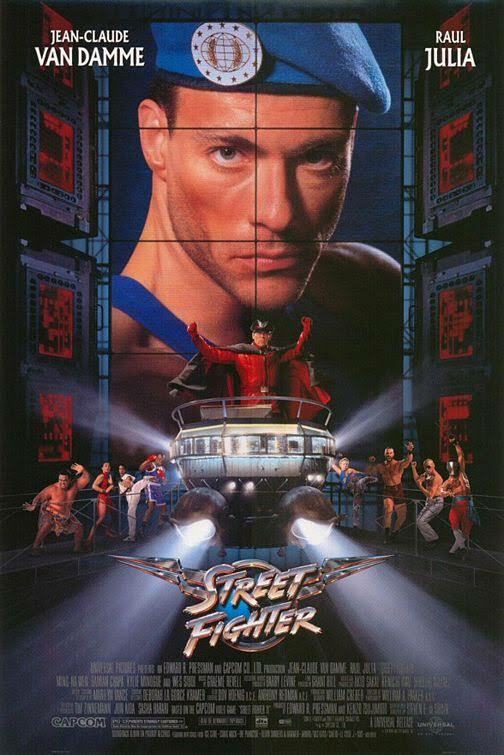 Released in 1994, Steven E. De Souza’s action film Street Fighter valiantly attempts to adapt the popular Capcom videogame Street Fighter 2. That it fails to do so is as close to inarguable as one can get. The film is a remarkable confluence of a first-time director, a coked-up movie star, a Japanese videogame publisher with no idea of what it really wants, and a studio fixated on a release date whether the production is ready to roll or not. Films adapted from videogames do not enjoy a positive reputation. While Street Fighter is hardly the worst example of its genre – that dubious honour likely belongs to Mortal Kombat: Annihilation or Super Mario Bros – it is a laughably awful ‘so-bad-it’s-kind-of-good’ extravaganza of historic proportions. A key problem is its story. The film deliberately abandons the entire fighting tournament set-up of the original game, and instead finds increasingly obtuse ways to incorporate the famous videogame characters into the narrative. General M. Bison is a dictator losing control of the fictional country of Shadaloo, with Guile running the UN-led forces attempting to drive him out – with the assistance of his offsider Cammy (Kylie Minogue, never a strong actor, giving the worst performance of her career). Meanwhile Ken (Damien Chapa) and Ryu (Byron Mann) are rogueish entrepreneurs over their heads in an arms deal with crime boss Sagat (Wes Studi, slumming it) and his pit-fighting bodyguard Vega. Throw in Chun Li (Ming-Na, who earnest tries to act above the material) masquerading as a TV journalist with her crew comprising the sumo wrestler E. Honda (Peter Tuiasosopo) and the professional boxer Balrog (Grant L. Bush), as well as Dhalsim (Roshan Seth) as a scientist forced to create the inexplicably green-skinned Blanka (Robert Mammone) and Zangief (Andrew Bryniarski), and you have a red-hot mess of too many characters with too little to do and each too briefly seen to even have a chance of engaging with their audience. There is little point in ignoring the story and just enjoying the action, since it works in a stop-start fashion and is neither performed well or shot effectively. For his part Van Damme over-acts like a cartoon, which is either a symptom of the cocaine or a genuinely smart move. If nothing else, he visibly recognises the quality of the film in which he has found himself. So why watch Street Fighter at all? It is a legitimate question, given that it is without doubt a terrible film. The answer is simple, and it’s one that transforms the whole production into something that everyone should sit through at least once in their life: Raul Julia. He’s incredible. Like Van Damme, he visibly knows he has walked into an epic misfire. Like Van Damme, he also pitches his performance like a Saturday morning cartoon. The difference between the two is that Van Damme is Van Damme, whereas Julia was one of the finest and most widely acclaimed actors of his generation. Street Fighter was the last film that he made before dying from stomach cancer and ludicrous as this final work is, it is testament to his talent and skill that, even weakened, sick and frail, he still acts circles around every other member of the cast. Not only does he get some authentically funny dialogue, he performs like a bug-eyed loon. It’s pitch-perfect, and honestly makes M. Bison one of my favourite screen villains of all time. It’s quite a lot like Frank Langella’s Skeletor in Gary Goddard’s Masters of the Universe, except in that case the film also boasted some fairly reasonable production design. Street Fighter really does rely on Julia alone to carry it. You have to see this one to believe it. You really never need to see it more than once, but you do need to see it.